The new Residents’ Club at Madeira at St. Augustine, depicted in this rendering, is nearly complete. Residents will enjoy the pool, fitness center and expansive outdoor gathering area. The Residents’ Club is nearing completion at Madeira at St. Augustine. This signature amenity in the master-planned community, located within the city limits of St. Augustine, is set to open in the Spring. 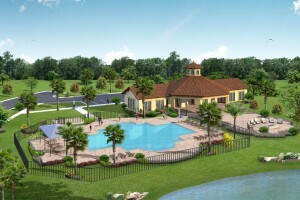 The clubhouse will feature a fitness center, a large pool, surrounding deck and adjacent party plaza. 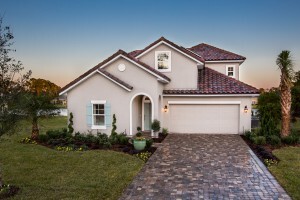 Its design complements home styles and the barrel tile roof with windows in the rooftop cupola provides a steady stream of Florida sunlight. The interior social room and the nearby covered pavilion will invite many neighborhood gatherings. Adjacent to the resort-style pool, the large covered patio offers seating for groups to encourage gatherings and a firepit will provide a focus for the community. Homes like the newly constructed Capri model at the Madeira at St. Augustine community are enhanced by thoughtful streetscaping. Three distinct elevation styles are priced from the mid $200s and range from 1,767 square feet to 2,962 square feet and several homes are now available for move-in. The community is located on U.S. 1 in northern St. Augustine on more than 1,000 acres of green space in a lush natural environment. The sales office is open daily 10 a.m. to 5:30 p.m. Monday through Saturday and 1 p.m. to 5:30 p.m. on Sunday. For more information, call (904) 484-9024 or visit www.elacora.com.